Spark and rekindle your romance in each of seven individually designed and decorated country cottages. Each one a delightful retreat just for two. 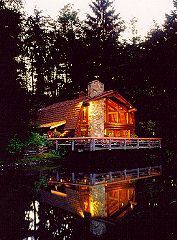 "The Log Lodge", also for two.is truly. a magnificent architectural treasure. 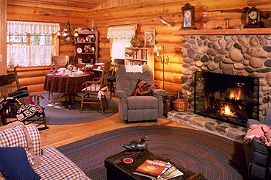 With superb amenities each cottage is a relaxing discovery featuring country antiques, fireplaces, kitchens, personal jacuzzis, a complimentary video library and featherbeds you can tuck your toes into. 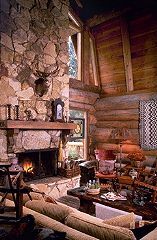 There are four log cottages and two of frame construction. Spacious wooded grounds and an outdoor swimming pool and hot tub. This is a special island retreat affording 25 acres of total privacy, a place you'll return to again and again. Rates begin at $165 to $325, two-day minimum stay. (one day by chance) Major credit cards accepted. Listed in "Best Places to Kiss" , "50 Romantic Getaways". Mid-week winter rates November 1st to March 15th.